Many thanks to everyone came out last night, braving a blizzard and possibly a St. Paddy's Day hangover to check out the show. However, due to a scheduling mishap, the Real Coyotes played solo, and Inch Chua and Mary Stewart will be coming to the Spill tonight, March 19. So JC and I are happy to reprise our show again with them. If the weather scared you off yesterday, fate has given you a second chance! 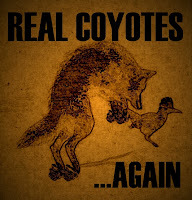 Return of the Real Coyotes! I missed this project while it was gone. Now my partner JC Pigeon is back, we're getting picking again at 8:00 pm Monday, March 18 at the Spill (414 George St. N, Peterborough). Expect wily old-time tunes written by myself and JC. Mr. Pigeon will be playing guitar and mandolin, and I'll be handling the guitar, banjo, and maybe a homemade thingy or two. Howlin' harmonies abound. Our music has been known to induce labour, joyful incontinence, spastic dancing, and accelerated hair growth. Or you can sit further back and enjoy the subtle lyricism. Either way, I hope you make it out. After lots of solo shows, I'm stoked about this duo and promise to goose your boring Monday night. If you can't make it next week, the Real Coyotes will be appearing again at the Spill April 16.